My Print O’The Wave-stole has yet another corner! It’s finished! I’ve grafted that fourth corner and I’ve fastened the loose ends. 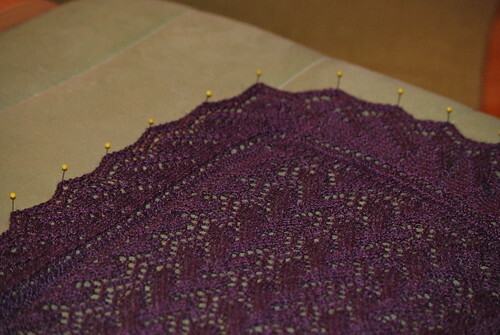 Now it’s time for blocking. Thanks again to Linda who came to my rescue and helped out when I lacked yarn to finish my stole. This entry was posted in Creative, In progress, Knitting and tagged creative, generousity, knitting, shawl, yarn. Bookmark the permalink. Oh yay, that’s just LOVELY! That is just BEAUTIFUL, Anna!! I love it!